Today’s topics: Dr Smith’s book “How to Go from Being a Good Evangelical to a Committed Catholic in Ninety-Five Difficult Steps”, Dr Smith’s research with the National Study of Youth and Religion. Summary of Today’s Show: Scot, Fr. Matt, Stephen Colella, and Dr. Christian Smith talk about trends in beliefs in youth and young adults and Dr. Smith’s new book about his conversion to the Catholic faith. 1st segment: Scot asked Fr. Matt about the results of the Witness to Truth retreat last week. Fr. Matt said that the retreat sent 30 teens back into their parish communities on fire and ready to lead their fellow Catholics. He described that the retreat has a bit of leadership feel and some camp feel as well, and challenges youth to go deeper into their faith. Scot explained that the work of Dr. Christian Smith figured heavily in the recommendations of a faith formation committee formed by Cardinal Seán several years ago. Fr. Matt agreed that the research provided by Dr. Smith’s books gave the committee many insights and helped them look at remedies to the problems they faced. 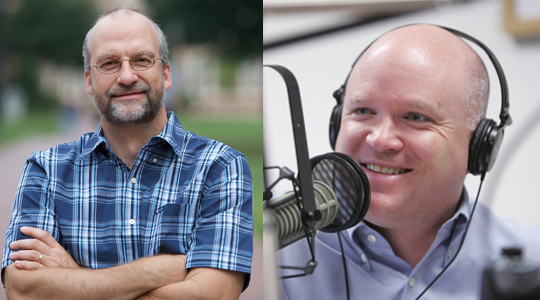 2nd segment: Scot welcomed Dr. Christian Smith, a Professor of Sociology at Notre Dame University and Director of the Center for the Study of Religion and Society, and Stephen Colella, Assistant Director of the office of New Evangelization for Youth and Young Adults. Dr. Smith described his work with the National Study of Youth and Religion, a research initiative to study the formation and religious beliefs of young people of various faiths. He said the study has been ongoing since 2000, starting with participants ages 13 to 17 and ending in 2020 with a final survey when they are ages 25 to 29. Dr. Smith described that the study, detailed in his book Soul Searching, found a commonality among teens across all religious beliefs and practices, something he calls “moralistic therapeutic deism” or MTD. He says that MTD is a watered-down version of Christianity where youth acknowledge the existence of God but do not have a strong relationship with Him. It is not faithful orthodox teaching, but rather an adaptation of faith to fit their lives. He said the key element of MTD is that the purpose of life is to be happy but that God can keep a distance from life until someone gets in trouble or needs a problem solved. Dr. Smith reiterated that regardless of their denomination or religion, most teenagers fit into the category of having a faith characterized by MTD – they see that their relationship with God is on their terms and not His. Fr. Matt asked Dr. Smith to outline the reasons for the development of MTD. Dr. Smith emphasized that young people tend to get along on religious terms because they share this “religion.” He says his research shows that teens drift towards MTD because of a lack of effective catechesis, not having venues to share and discuss their faith, and influence from parents. Parents often get the message that they don’t matter anymore once their children are teens, but Dr Smith maintains that they are even more important during teen years. Dr. Smith said that out of all the teenagers, Catholic teenagers were the most disengaged and apathetic; however, when data was normalized to account for the religious influence of parents, Catholic teenagers came out on the same level as other levels. He says this shows statistically that the reason Catholic teens are less involved in Mass and their faith is because their parents are. A combination of factors lead to the decline of parental influence in Catholicism, Dr Smith said, culminating in the fact that Catholics in the 1970s were culturally assimilated. He said that living in the suburbs away from a strongly Catholic community (in a physical way) and the reduction of the importance of the Church with neighbors made Catholics going to Mass on Sunday be just like every other religion in many ways. 3rd segment: Scot asked Dr. Smith to explain some of the follow-up research in his second book, Souls in Transition: The Religious and Spiritual Lives of Emerging Adults. Dr Smith explained that the youth they started studying were now 18 to 23 years old, and that it was fascinating to see them transitioning out of their teenage years and into a college life and beyond. He said that even though there is an impression that teens at this age are re-evaluating their lives and determining their identities for the future, the majority of teenagers transitioning to young adults are tracked by continuity – that once teens are on a trajectory towards a decline in faith, it takes a strong personal connection or other motivating event to nudge them on a path back to the Church. Dr. Smith went on to explain that parents are a “sticky” effect and continue to affect emerging adults, even after they’ve left the home. Father Matt asked Dr. Smith if his research showed differences between teens at secular colleges as compared to religious colleges – Dr. Smith said it was difficult to refine different types of universities across the spectrum of religious commitment, but that a college environment with pastoral resources create the conditions for the possibility of a more faithful life. Stephen asked Dr. Smith to explain events that could help emerging adults change their trajectory away from faith – he said people are formed by relationships, and that role models and mentors tend to be what can affect youth the most. A formative relationship with a college professor or someone they build a friendship with can easily knock them off of one trajectory into another. Father Matt asked Dr. Smith where he would invest his resources to create a new system if he had the chance – Dr. Smith said that if he had a chance to start improving this problem, he would start with the parents of young kids by trying to emphasize goal-setting for both their own and their children’s faith lives. Scot said that many parents fear they are not knowledgable enough about their faith to teach their kids the faith, so they outsource it to religious education programs or other parents. He also commented that many parents don’t explain to their kids why faith is important. Dr. Smith agreed that outsourcing was a problem – he says that many of the parents these days were the first generation not formed as well in the 1970s, so to a significant degree it is not their fault. He went on to say that if the Church wants to rebuild its strength, it needs to focus on parents as well as youth. Dr. Smith also said that many teenagers appreciate when parents share in a simple, down to earth way what faith means to them. Scot commented that when Dr. Smith wrote How to Go from Being a Good Evangelical to a Committed Catholic in Nintey-Five Difficult Steps, he had a chance to learn many things about the Catholic faith. Scot asked him if there was any connection between Dr. Smith’s research and his conversion. Dr. Smith said that there was almost no connection – and that the data on Catholics should have pushed him away! He said that he felt it was a sign that he knew all this information about apathetic Catholic youth yet was still attracted to Catholicism. Dr. Smith and his wife were set on a course over many years that eventually led to the fact that the Catholic Church was the true Church, and that Protestantism was not. Scot and Dr. Smith both highlighted that the book was not just for Evangelicals, but is an educational read for Catholics as well and can help us learn more about our faith through a different lens. Step 12 in Dr. Smith’s book asks about where the New Testament comes from – Dr. Smith explains in his book that without the Catholic Church, the New Testament would not exist. This forces a logical decision – “…either the Catholic Church’s episcopate had a legitimate authority to define the content of New Testament scriptures or it did not have authority.” Dr. Smith said that it is difficult to deny the authority of Catholic Bishops after they have provided the basis (the New Testament) of what most non-Catholic Christians believe in. More Saints of the Bible by Theresa Doyle-Nelson, and a copy of Girls’ Night Out, a book by Michaelann Martin on how mothers can build relationships with their daughters. This week’s winner is Patricia Ponticelli from Amesbury. Congratulations Patricia! If you would like to be eligible to win in upcoming weeks, please visit WQOM.org. For a one-time $30 donation, you’ll receive the Station of the Cross benefactor card and key tag, making you eligible for WQOM’s weekly raffle of books, DVDs, CDs and religious items. We’ll be announcing the winner each Wednesday during “The Good Catholic Life” program. 5th segment:Scot asked Dr. Smith to talk about Step 59 – to decide “once and for all that there is something fundamentally and deeply wrong with denominationalism.” Dr. Smith explains that splitting off so many denominations makes faith into a consumer commodity – worshipers church-shop and try to find a faith that reflects their existing beliefs. He says it directly violates Jesus’ prayer in John 17 asking that his Church be one. Dr. Smith said that sociologists talk about religion in America as a market – each church has a market with a niche, turning believers into consumers. Steven commented that this division also feeds back into MTD, that youth can think of God in their own way and “pull Him off the shelf when they want him.” Scot moved on to Step 63, that authority does not mean authoritativeness. Dr. Smith said that in reality, Protestants do have authority, but it varies – it can be the authority of seminary professor, a preacher, a book author, anyone. He said the important part is not the authority itself, but rather who the authority is and what legitimacy the authority has. The Catholic Church has a legitimate account for its authority through the Pope, he said. Stephen asked Dr. Smith what his plans for the future were. Dr. Smith said he sees a need for a book solely on Catholic emerging adults that he will release in a few years that he hopes contributes a lot to the good work of Catholic youth ministries around the country.